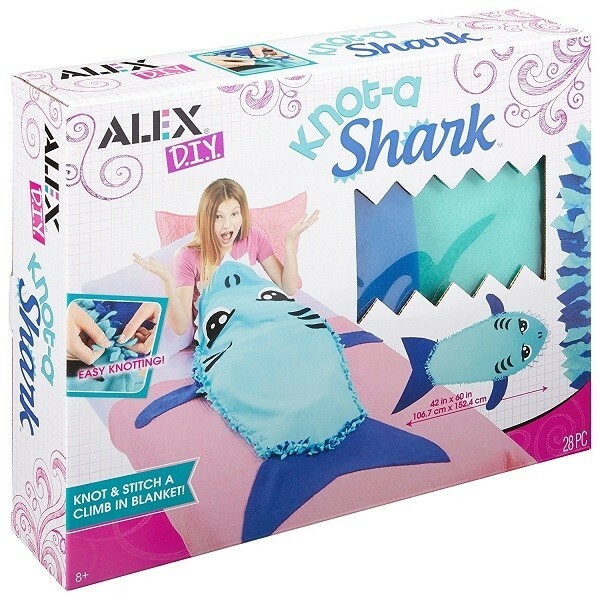 ALEX DIY Knot-A-Shark comes with everything you need to make every week Shark Week! Create your own snuggly, terror-of-the-deep blanket that you crawl inside of, ideal for naps, sleepovers or binge-watching your favorite show. Stitch together the shark's face with pre-punched fleece and felt pieces, then knot the sides closed and add a tail. When complete, the project measures 42in. x 60in. (106.7cm. x 152.4cm.). This set includes 5 precut fleece shapes, 15 precut polyester felt shapes, 3 colors of cotton embroidery floss, a needle, and easy instructions.